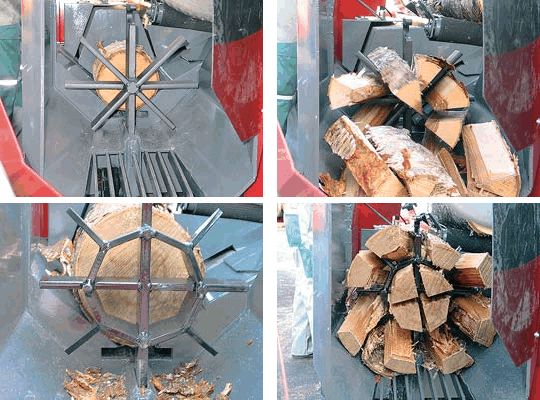 The Palax firewood processors have a wide range of different splitting axe sizes. The D360 Ergo, D360 Pro and D360 Pro+ come with a 2/4-way splitting axe as standard. Available options are the 2/6-way and 2/8-way splitting axe. The KS40 Ergo and KS40S come with a 2/6-way splitting axe as standard. Available options are the 2/4-way and 2/8-way splitting axe. The C900 comes with a 2/4-way splitting axe as standard. Available options are the 2/6-way and 2/8-waysplitting axe. The Power100S comes with a 2/6-way splitting axe as standard. Available options are the 2/4-way, 2/8-way and 12-way splitting axe. The KS45S comes with a 2/6-way splitting axe as standard. Available options are the 2/4-way, 2/8-way, 2/10-way and 12-way splitting axe.